Ministers cite Trajtenberg debate as reason for not attending. Head of memorial organization: "Shameful and disgraceful." There were no government ministers at one of the two central ceremonies commemorating the soldiers who lost their lives defending Israel in the Yom Kippur War 38 years ago. 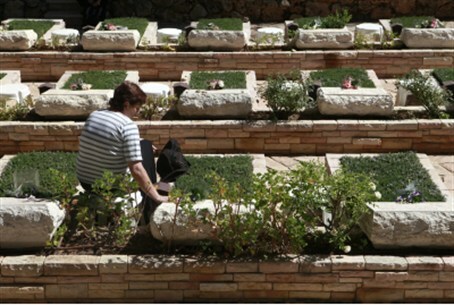 While Home Front Minister Matan Vilnai represented the government at the ceremony in Jerusalem's Har Herzl Cemetery, no minister showed up at the ceremony in Tel Aviv's Kiryat Shaul Military Cemetery, which was organized by Yad LaBanim, the organization that memorializes the IDF's fallen sons. Bereaved families were hurt and incensed. Several ministers who were scheduled to be present at the ceremony explained their absence by saying that the government debate on the Trajtenberg Report required their presence. "This is simply a disgrace, it is shameful," said Eli Ben Shem, the head of Yad LaBanim. "While the government discusses social justice it creates injustice somewhere else." "In deciding not to come," said Ben Shem, "the ministers delivered a harsh message to the fallen and to the bereaved families – the State of Israel does not want to remember that several decades ago, 2,700 soldiers were killed for the sake of defending the Land." "The soldiers paid the price of the leadership's ineptitude," he added. "Almost 40 years have passed and nothing has changed. I expect the government of Israel to do some soul searching to ensure that such a disgrace does not repeat itself. Treating bereavement lightly has become standard. Yad LaBanim will not remain silent on this matter."